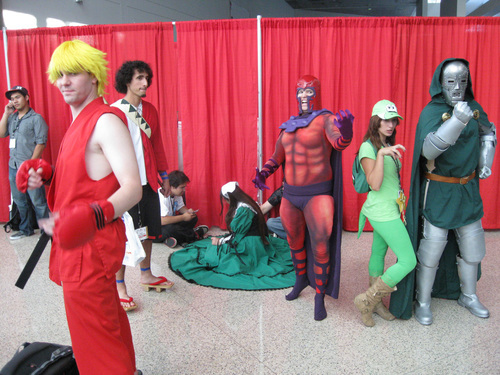 I just can't get enough of Magneto's costume. 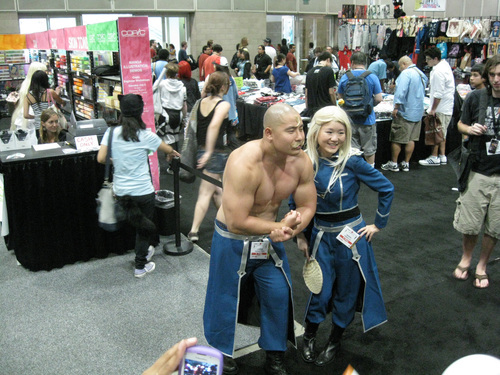 The muscles are perfect. 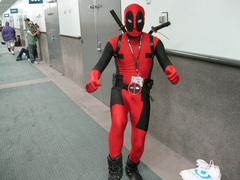 Next we have two different Deadpool cosplayers. The first is using his 4th Wall Crisis Hypercombo. 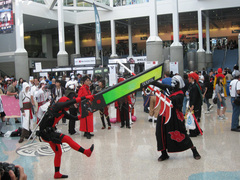 His health bar prop was spot on and the image was on both sides to allow photography from all angles. The second Deadpool-er gives us the thumbs up. 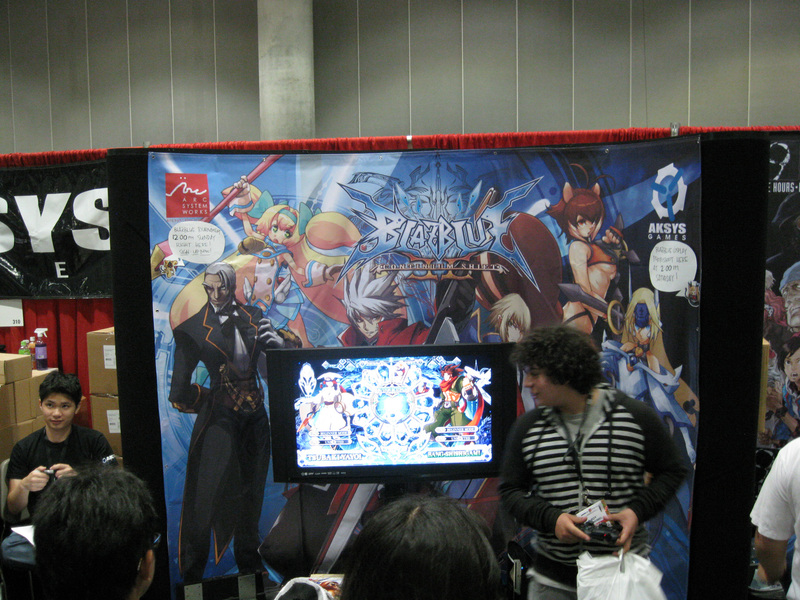 Everyone loves to play BlazBlu and fans enjoy the characters. 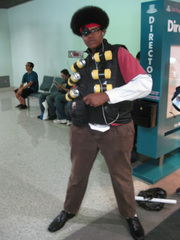 We saw another Noel cosplayer who had her shotgun. 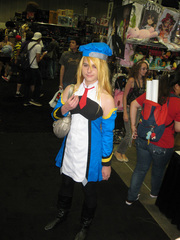 The Rachel cosplayer had bright red eyes which you can't see in the photo. 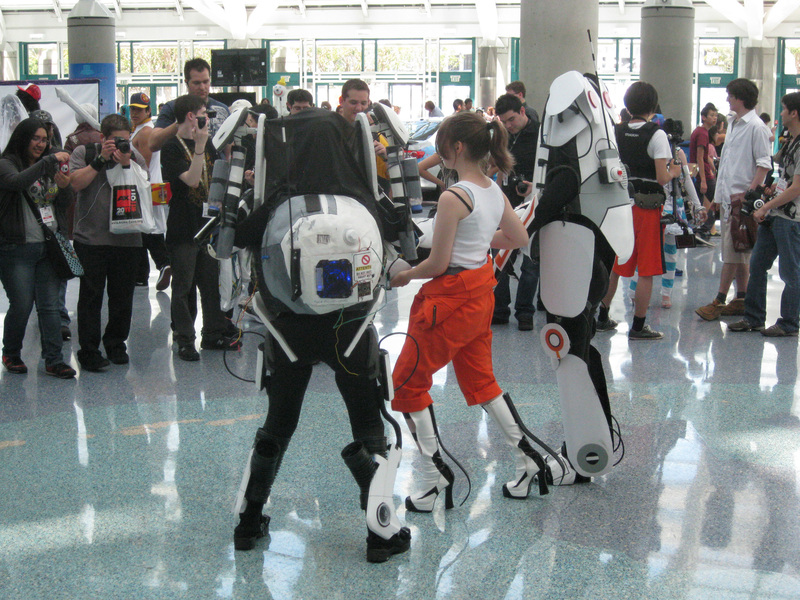 The Aperture Science employees have been hard at work designing the best way to put a human inside the Atlas and Peabody bots, ala the Cooperative Testing Initiative. 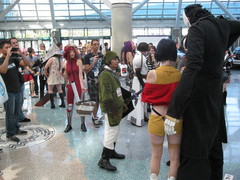 The goal is to attain the extra second of cooperation needed to make humans once again better test subjects than robots. 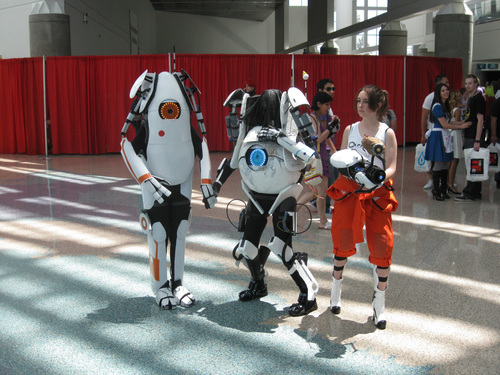 As for the orphaned test subject, we see she is using the newest model of our Quantum Tunneling Device, which simple people call a portal gun. 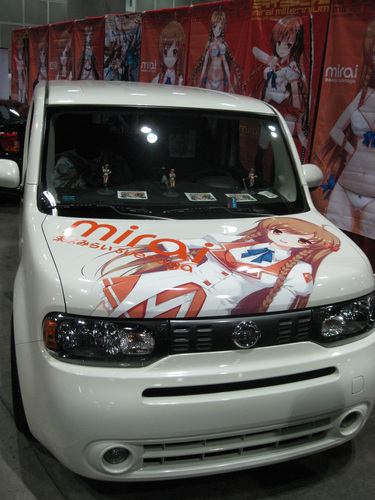 This year's model comes equipped with optional science fair potato holder for when you need to do science on the run or just need easy snack access. Test Subject Chell is also using our outdated prototype, the Long Fall Boot. Good work boots! 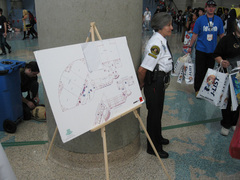 Aperature Science rewards 9001 Science Collaboration Points, you monster. 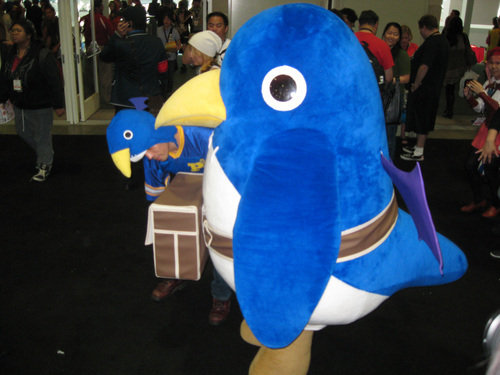 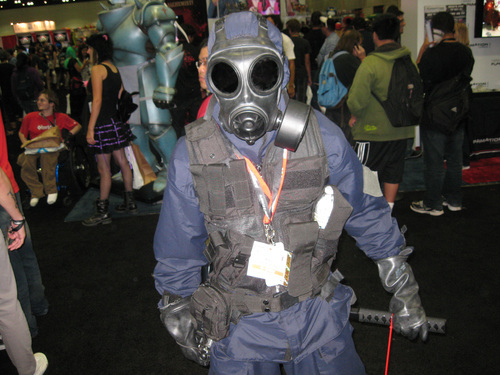 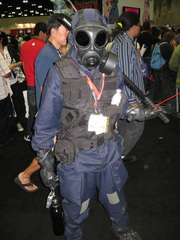 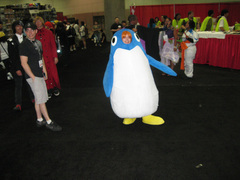 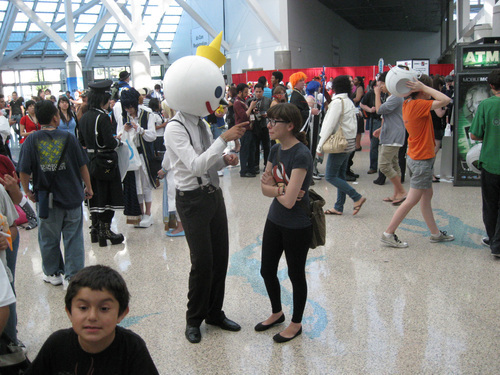 I do not know who or what this cosplay is supposed to be. I'm guessing a Bone Demon or Succubus probably not inspired by an anime or manga. Her makeup is outstanding with the red blood making it look like her nose is damaged and the scary left eye. A lot of time and effort has gone into this costume. The results are a good kind of creepy. 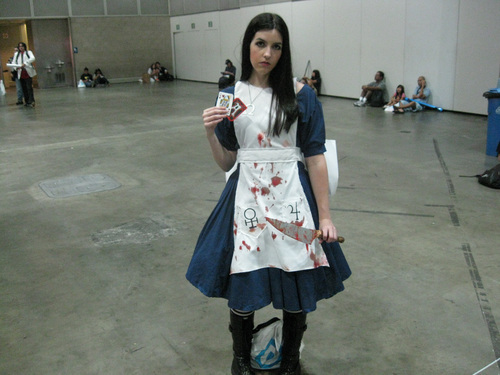 I'm a big fan of the art design of Alice: Madness Returns. 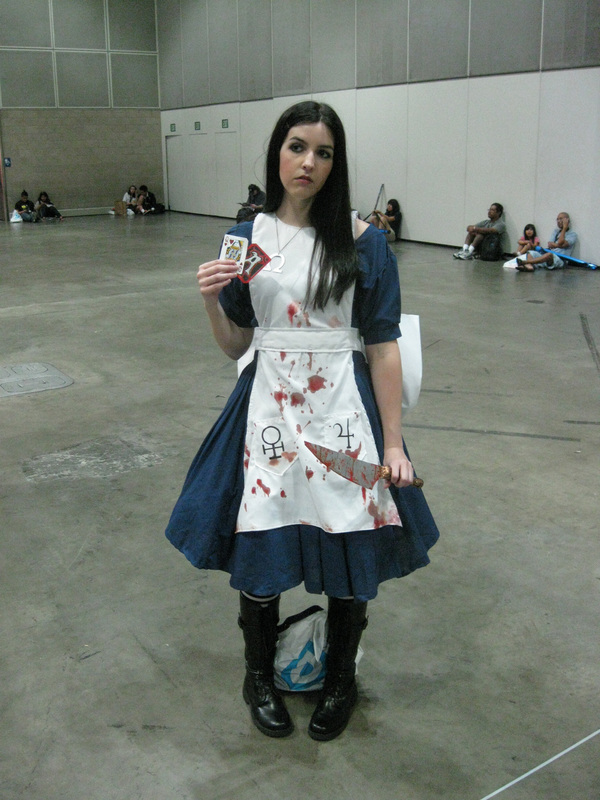 When I saw Alice go by, I had to get her photo. Little did I know she was going to pull out the Queen of Hearts and her knife. Luckily the blood stains on her dress weren't recent and I was able to make a quick escape. 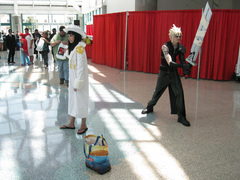 Next is a really well done Cloud Strife from Final Fantasy 7: Advent Children. He has the tattoos, manageable spiky hair and stylish sunglasses. 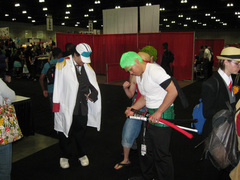 Thank goodness his Buster Sword isn't twice his size. 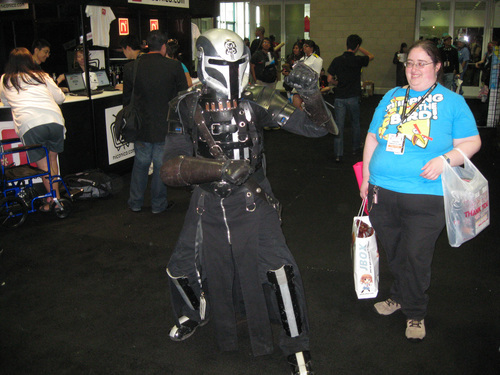 Here is the ultimate battle I envision between a Star Wars Mandalorian Bounty Hunter (not Bobba or Jango Fett) and Sudowoodo (not grass type pokemon). The Mandalorian would open up with a karate chop or other "Fighting" martial arts maneuver. 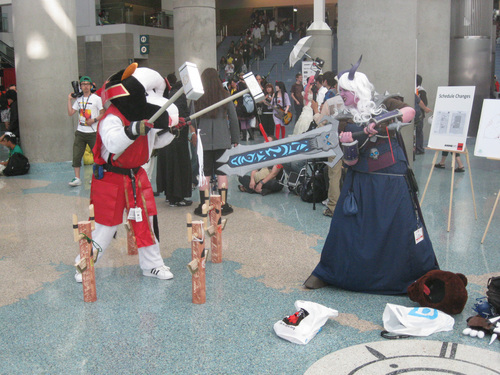 It's Super Effective! 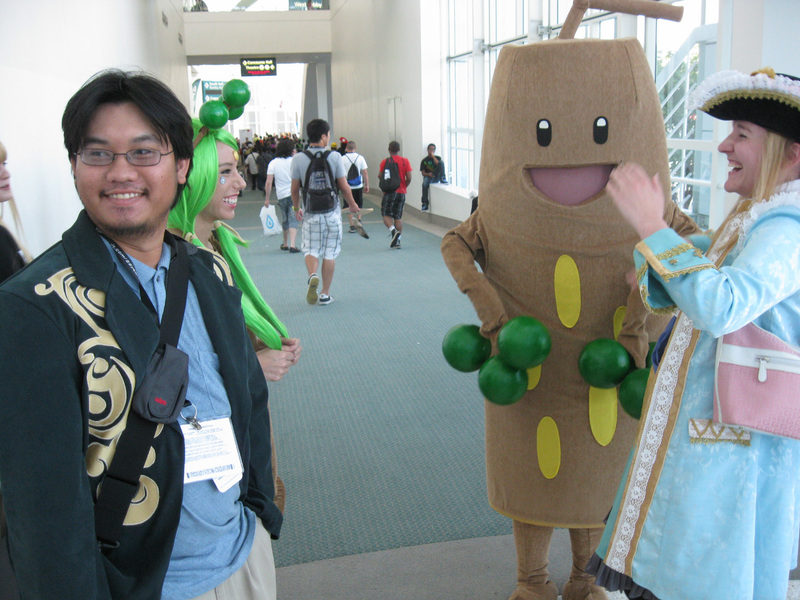 Sudowoodo takes double damage because he is a rock pokemon and rock is weak against fighting. 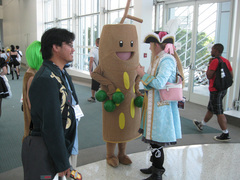 Sudowoodo responds with its smiling Charm move. Since I don't know the gender of either combatant, I say the charm was successful and they give each other a big hug. No contest for the cutest couple here. 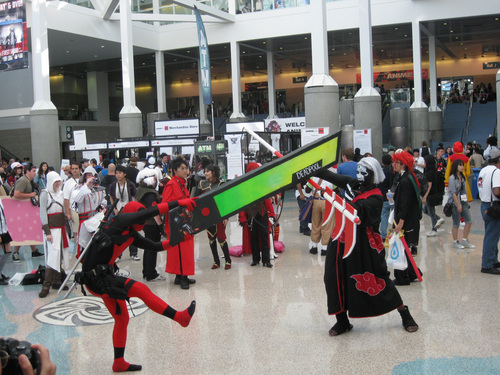 Nah, there is no competition. 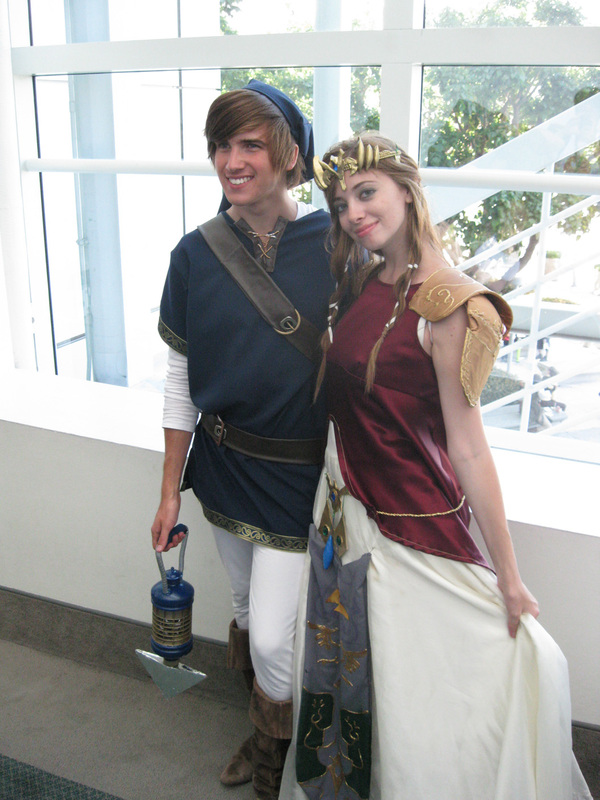 It's been a while since I've seen a blue Link cosplayer and I only noticed her was wielding the hookshot as I was about to walk away. I believe this is the Twilight Princess Princess Zelda (yes that's a double princess) as she is wearing shoulder spaulders. The woman is blue is none other than one of Lady Gaga's little monsters. 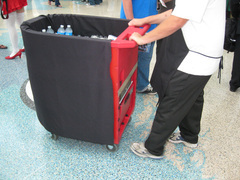 The costume is good and feels mainly inspired by Lady Gaga. 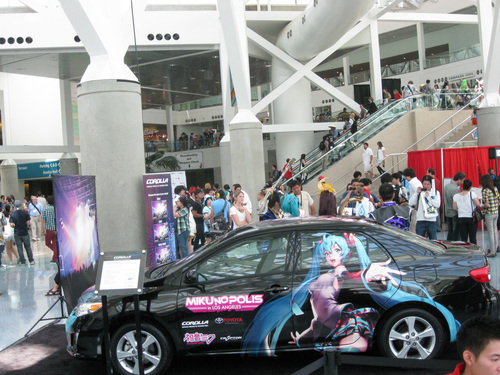 For some reason I expect more mascara, even bigger glasses and backup dancers. 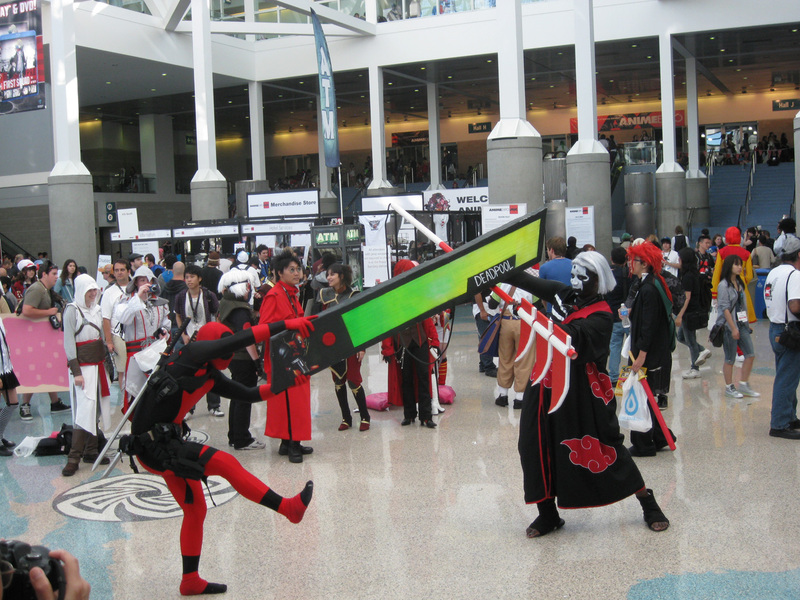 I'm going to guess the guy is the Red Beetleborg from Big Bad Beetleborgs but I'm probably wrong since I'm also thinking about VR Troopers. 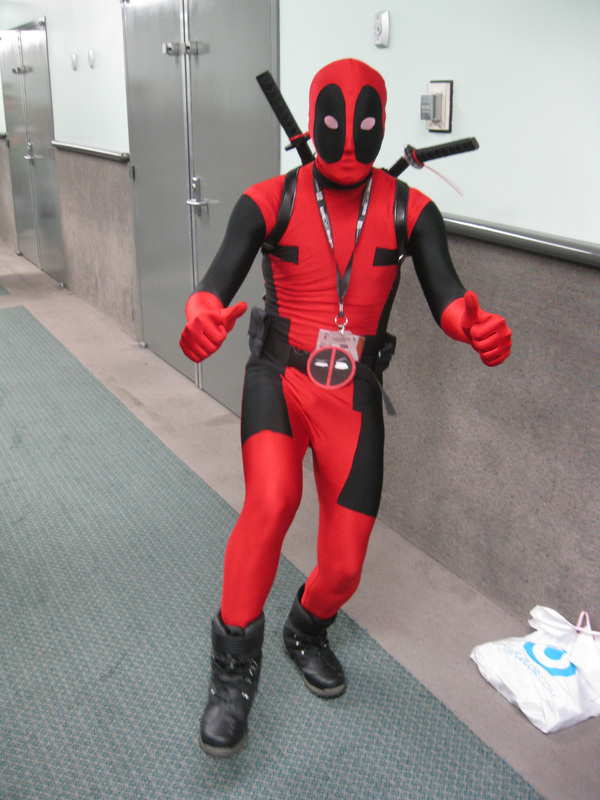 If it weren't for the helmet. 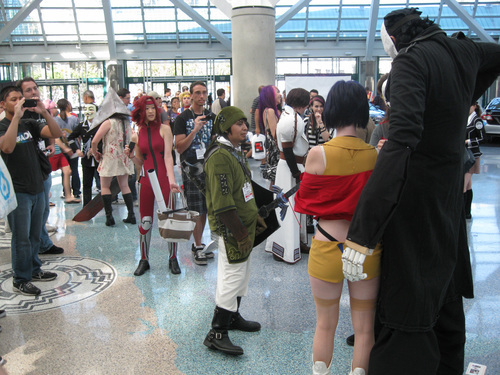 Otherwise I would have thought it was a Commander Shepard since technically any person could correctly cosplay as Commander Shepard. 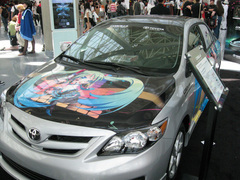 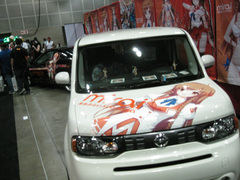 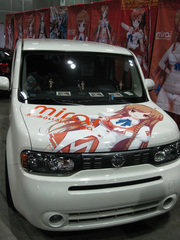 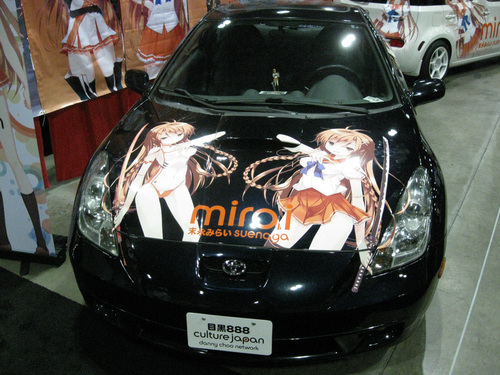 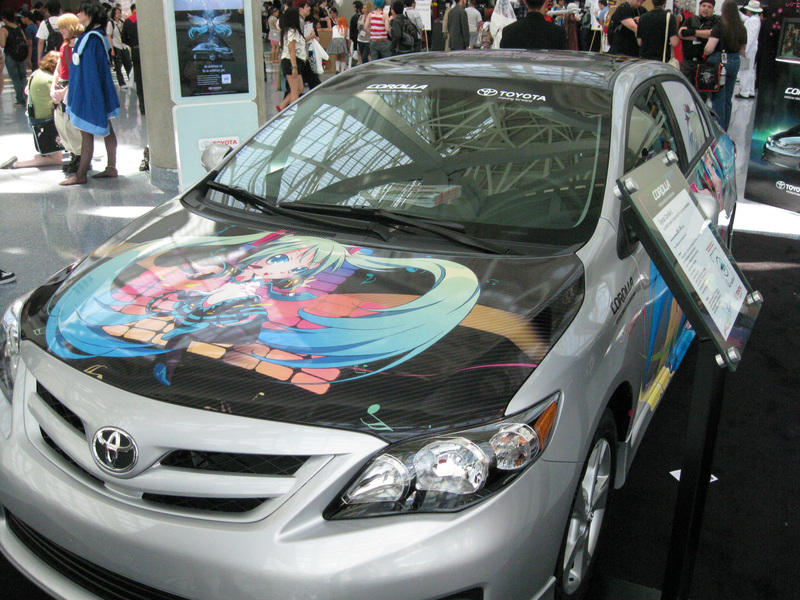 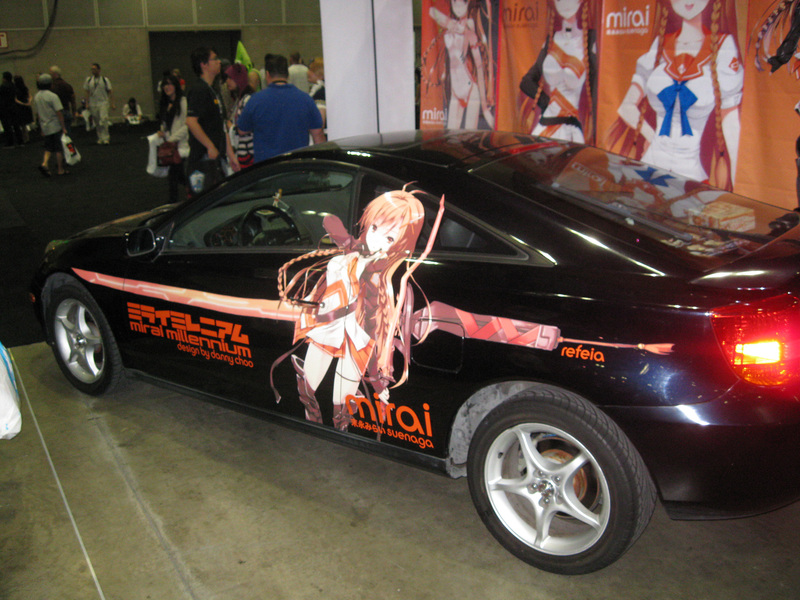 There isn't much to say about these vehicles except I would not want my car with anime inspired paint jobs. That's just asking for someone to key your car or steal it in Los Angeles. 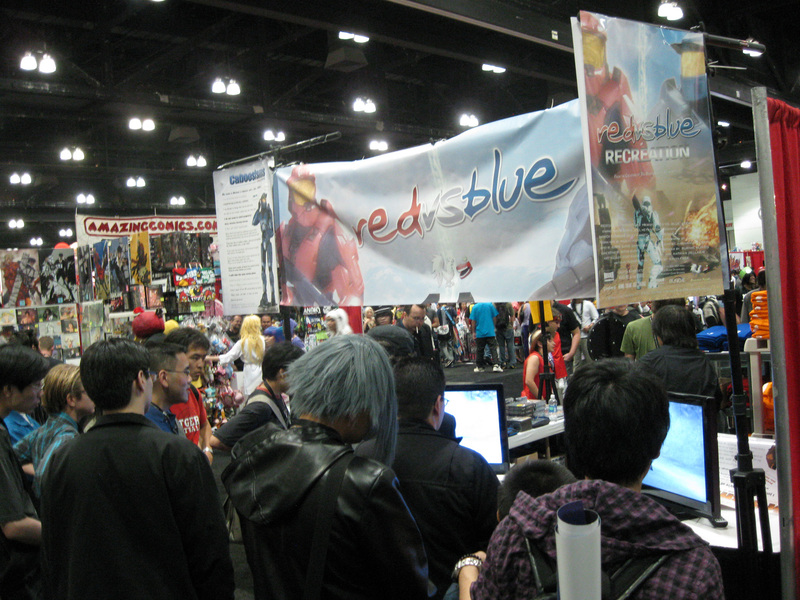 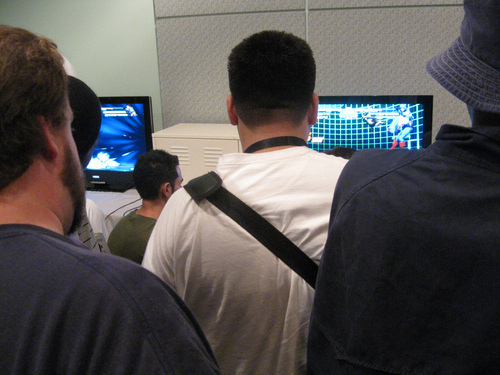 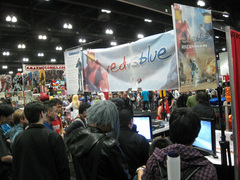 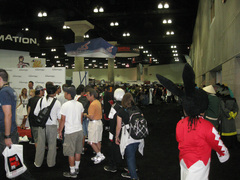 Since people love Red Vs. Blue, I took a picture of their booth which was playing one of their machinima episodes. 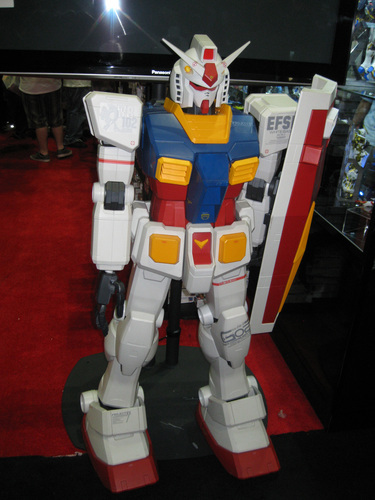 The Gundam booth gets some love with their large Gundam statue. 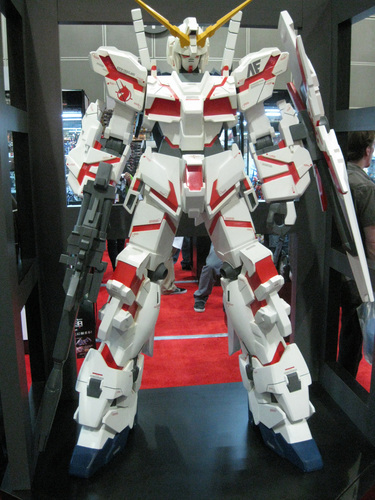 Oh it was tall and could have come to life at any time to fight other robots. 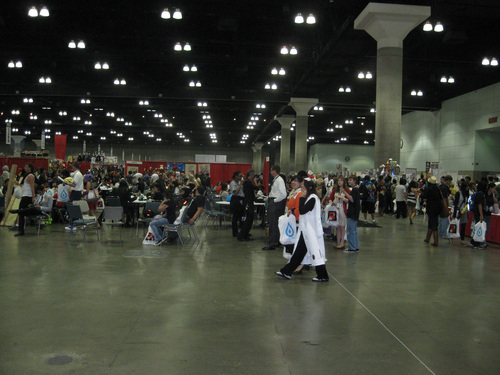 I always enjoy taking photos of cosplayers more than shopping in the merchant hall or attending events.We are attending at least two days of the convention so maybe we can post a second gallery of pictures taken Saturday when they are ready. 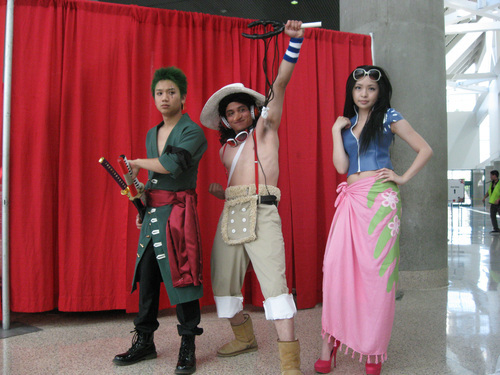 *I'm interested to know what is your favorite cosplay and has the costume quality improved compared with prior Anime Expos? 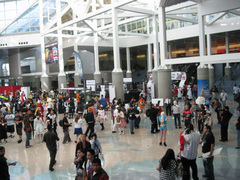 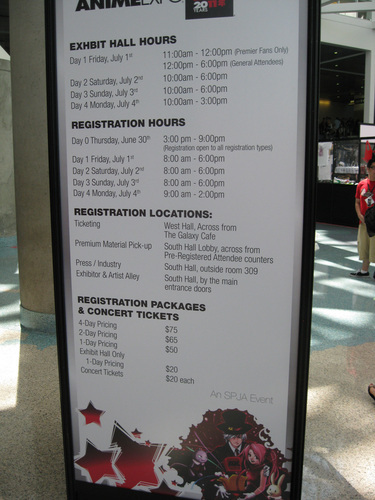 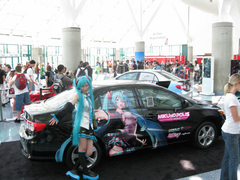 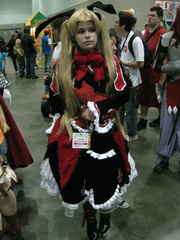 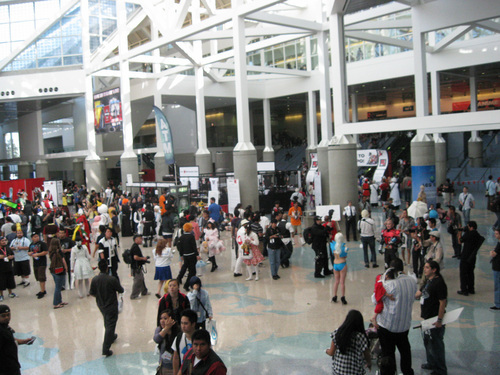 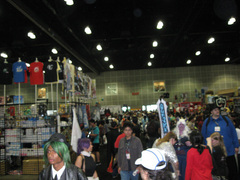 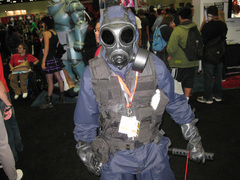 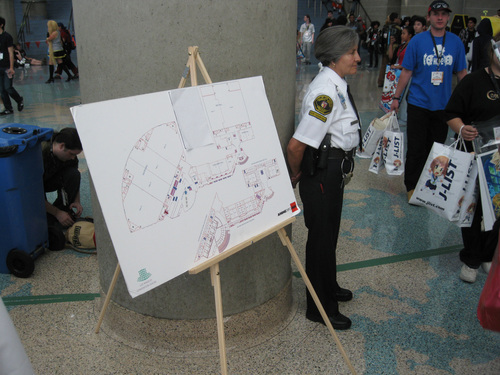 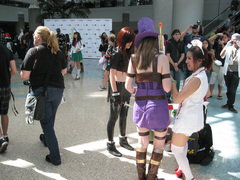 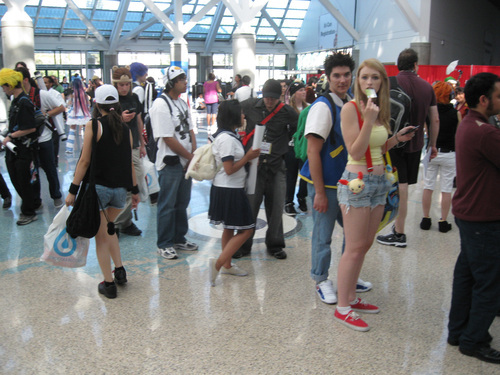 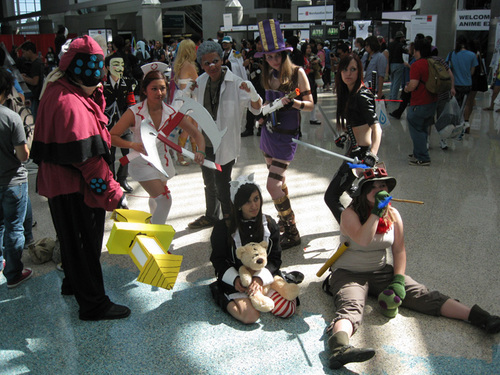 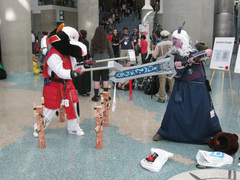 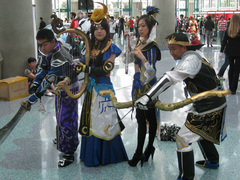 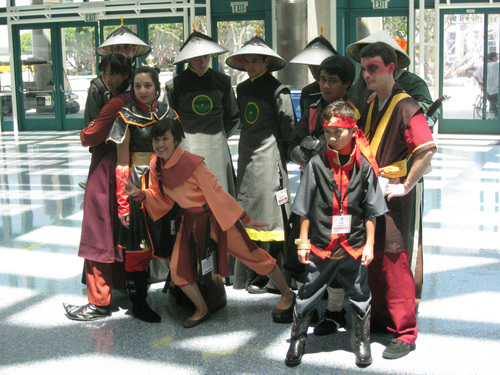 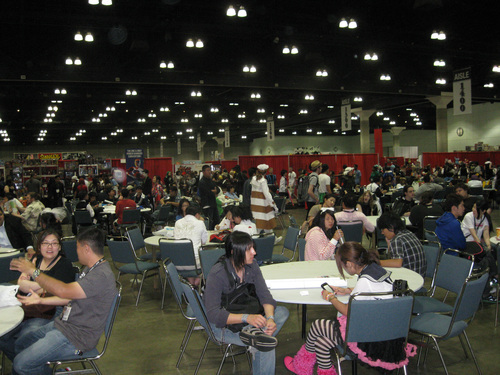 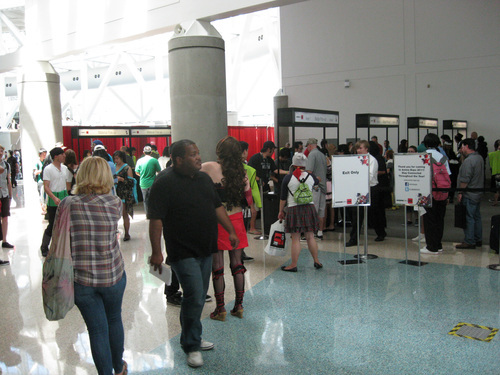 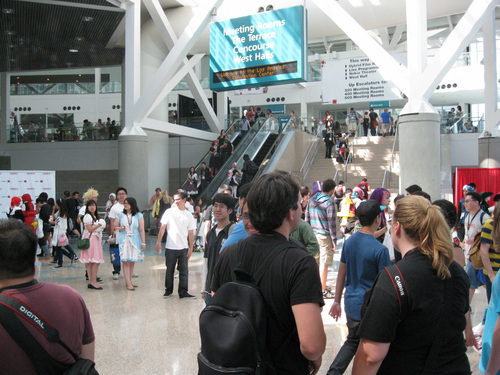 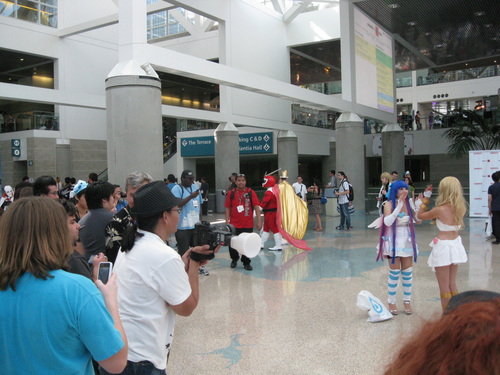 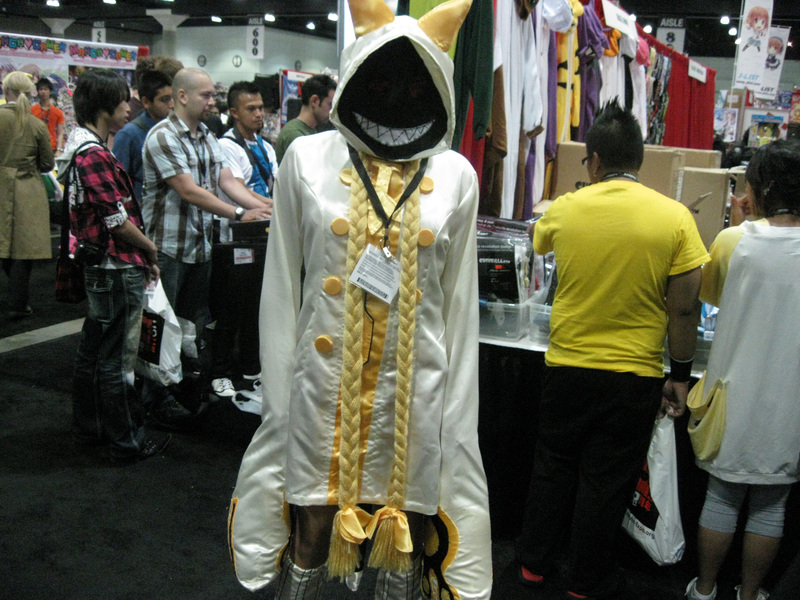 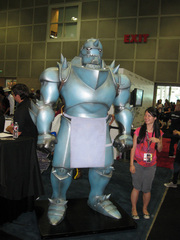 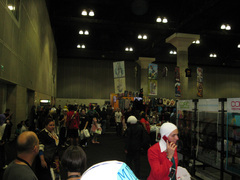 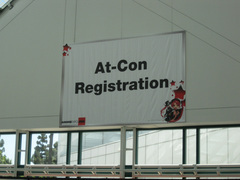 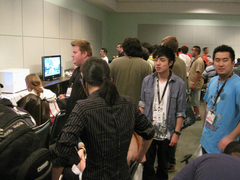 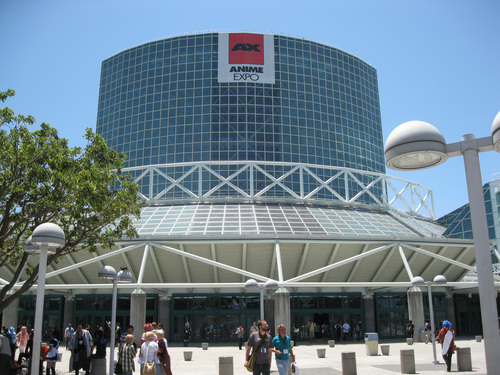 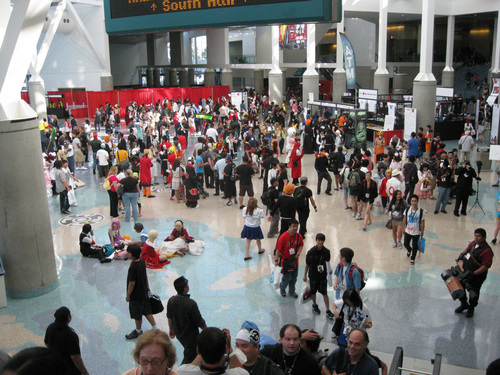 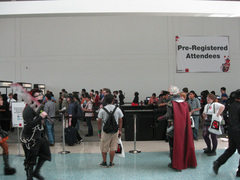 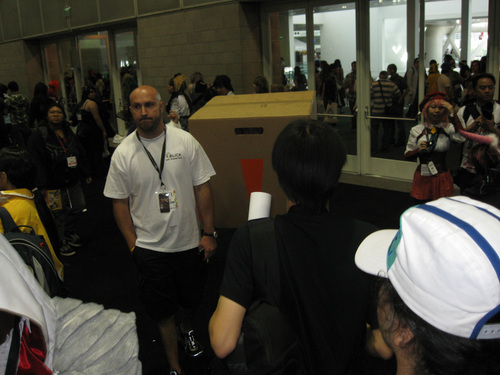 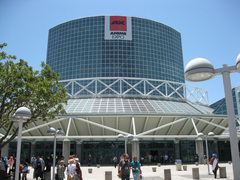 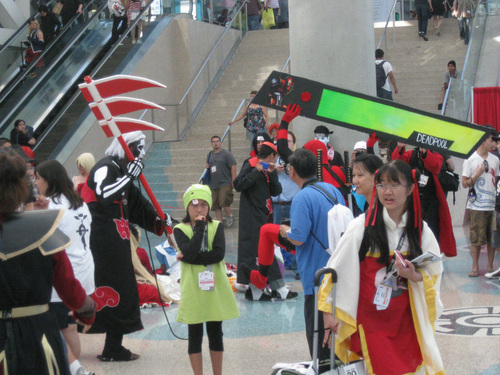 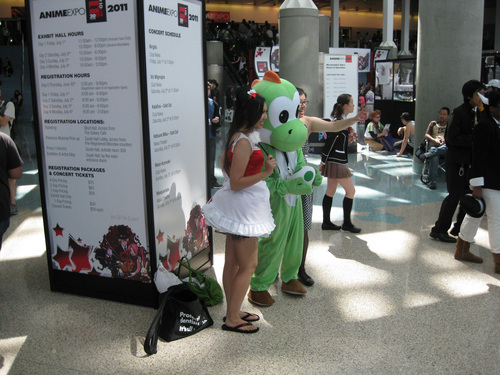 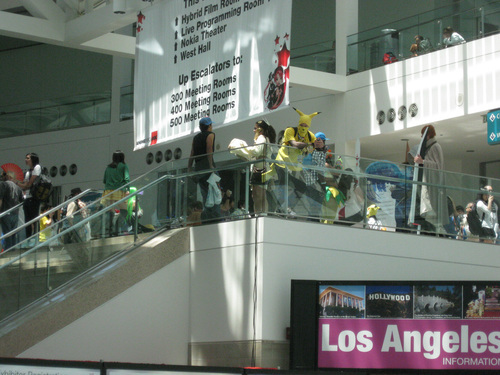 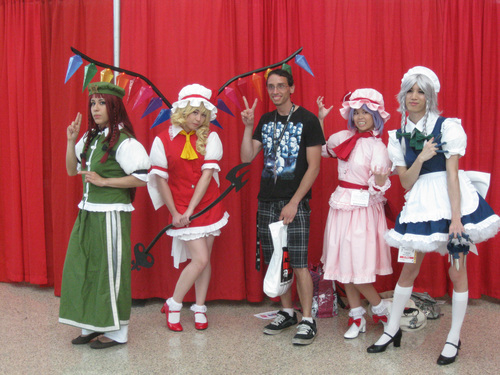 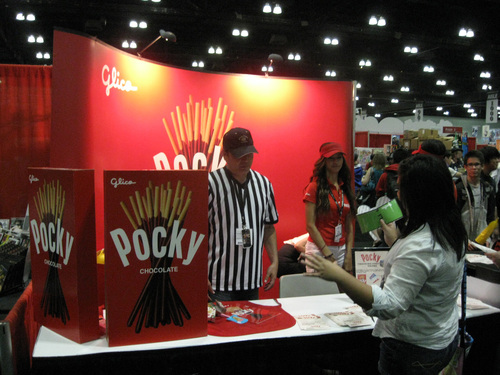 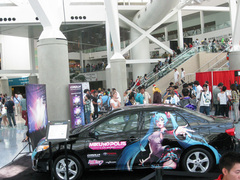 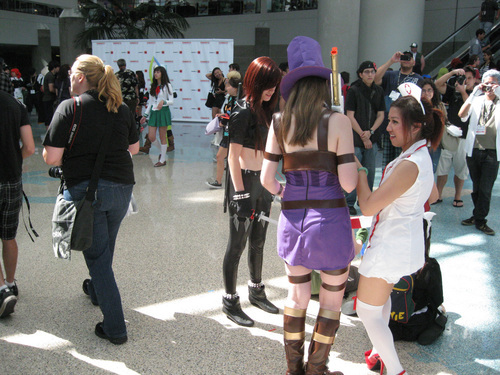 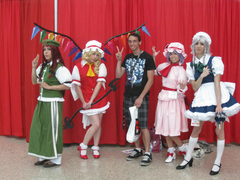 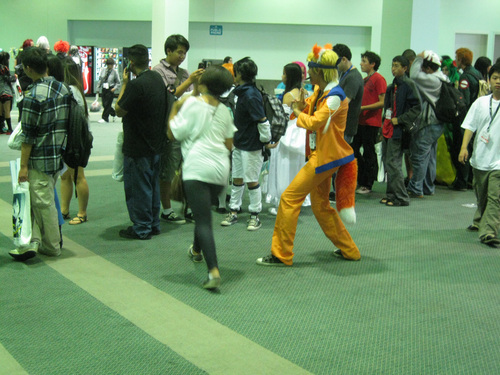 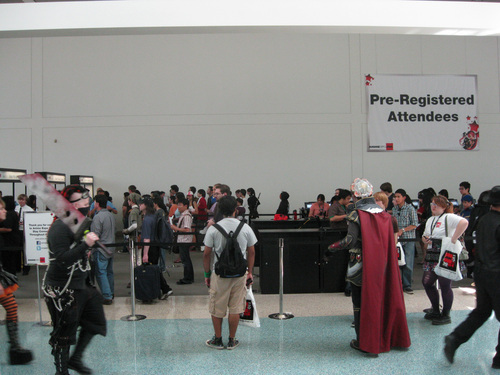 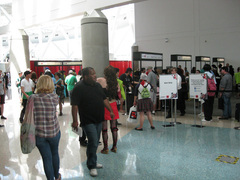 This year's edition of Anime Expo 2011 was held at the Los Angeles Convention Center from July 1-4 ..wow these pictures are lovely! 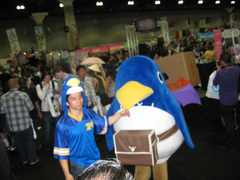 i enjoyed going through your blog! its awesome! 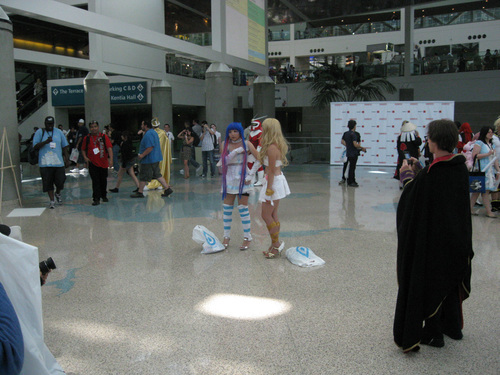 Now wouldn't it be nice to have a pic of the character next to the cosplay…or at least the name of the character and the anime/game..that way, the cosplayers work won't be wasted on those of us with otakuism deficiency. It's totally cool. 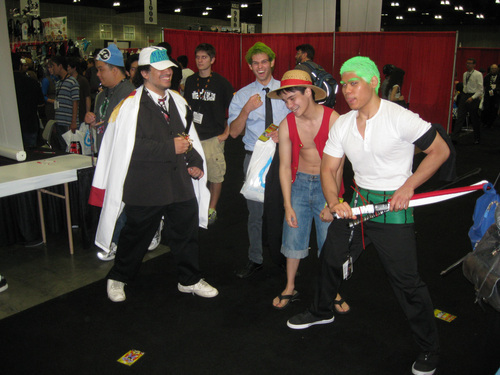 I am not an otaku and I suffer from the same problem described. Luckily the video game and Marvel references are extremely recognizable. Fortunately, the video game references and Marvel are extremely recognizable.It the totally cool. 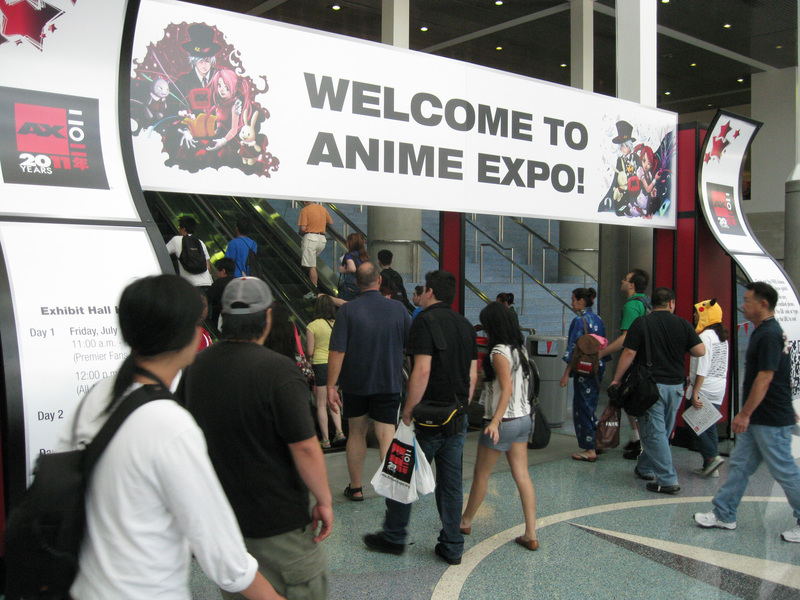 I'm not an otaku, and I suffer the same problem described.